Summary: In the title story, Lucinda hatches a clever plan to get her boyfriend back and is crushed when she ultimately realizes that it’s impossible to force a guy to love you. Like all young people, she ignores the advice of her mom and learns that lesson—and many more—the hard way. 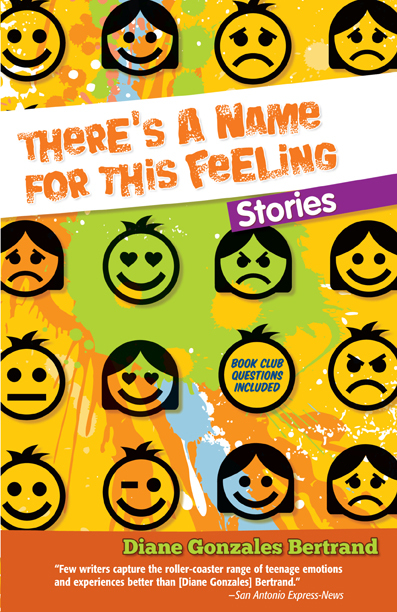 Review: There’s a Name For This Feeling: Stories is aimed at the younger end of the YA spectrum, but this collection of ten short stories makes up for its slim page count with some hard-hitting vignettes. Each of the stories is tightly focused on a different character, and while some stories share similar elements (there are two stories involving grandmothers who have dementia, for example), the approach to each is unique. Diane Gonzales Bertrand excels at showcasing a broad range of emotions in these short stories, and they come together to form a mostly compelling, slice-of-life exploration of Latin@ teenagers. The stories are a good mix of serious and funny and touching (and sometimes a bit of all of those). While the collection is a pretty solid one, I wasn’t enamored with all of the stories. Neither “Agapito” nor “The Naked Woman on Poplar Street” were interesting to me, and I disliked the framing device in “Trajectory.” These stories only distract a little from the rest of the collection, but I do wish I had been able to enthusiastically endorse all of them. Teachers may also be interested to know that the book also includes discussion questions (Ideas for Conversation) and writing prompts (Ideas for Writing). All of the stories, along with the discussion and writing prompts, are translated into Spanish. This collection would be an especially great addition to classrooms with Spanish-speaking students. Recommendation: Get it soon, if you’re a teacher looking to expand your short story curriculum—otherwise, borrow it someday. It’s a short, fast read with some great slice-of-life explorations of Latin@ teenagers. The stories fall at varying places on the spectrum of “great” to “boring,” but the great stories make There’s a Name For This Feeling: Stories worth checking out. This sounds like it would hit my demographics perfectly. Thank you for your very detailed comments on the stories you liked and the ones you didn’t love.